To live at IHD is to live in the Australian tropics, and that’s different. It places you in indigeneous and multicultural Darwin, and that’s distinctive. It locates you in the Northern Territory on the doorstep of South-East Asia, and that’s unique. IHD operates within the time-honoured traditions of academic residential communities. Our students come together from diverse countries and cultures as well as all parts of Australia to learn and live and bond together. Some folk point out that learning to live well in a community is an education in itself. 400 students at IHD take up that challenge every day. That’s not easy but it’s also not hard. When residents commit to the values of respect, understanding, encouragement and friendship then the collegiate experience transforms them. A happy heart promotes a happy mind and so a better scholar. People thrive in company and seek out the fun and joie de vivre of being involved. Together they create memories and the ties that bind. To live at IHD is to join also International Houses Worldwide. This is a network with more than 9,500 current students and a living alumnus exceeding 350,000 spread across the continents. Just imagine your future! Student accommodation at Casuarina was built during 1973. A cluster of comfortable town houses, they were in fact occupied by university staff during 1974 only to be obliterated by Cyclone Tracey on Christmas Day that same year. The townhouses’ rubble was used to create an amphitheatre covered in time by grass and a grove of trees. Located on the low-lying south end of what was then the Darwin Institute of Technology, the original accommodation was prone to storm surges and so, with the rebuild after Tracey, plans were made to locate new accommodation on the higher northern end of main campus. Doors of the new establishment opened on 4th October 1985. It was an inauspicious start with just the Manager, Mr Martin Heskins, welcoming the first of two residents that day. The site was a dustbowl, not a tree or blade of grass in sight. The first international student, from Brunei, arrived as part of an initial intake of 66 students in 1986. Most came from the Territory and many were young male apprentices studying in six week trade blocks. Long term residents included both genders though women outnumbered men. 162 students at Myilly Point joined those at Casuarina when Northern Territory University emerged in 1988. These students were housed in the former nurses’ accommodation for Royal Darwin Hospital. NTU itself was an amalgamation of DIT and University College of Northern Territory. In 1990 Casuarina and Myilly Point were brought together under the one administration and named University House. Its first Warden was Mr (today, Rev Dr) Philip Raymont. His finance manager was Martin Heskins who had managed Casuarina’s accommodation from 1985. Under Raymont, University House sought to build itself in the image of a traditional residential academic college. It had an academic program run by live-in tutors, pastoral systems for student welfare, and social activities to create a culture of involvement, commitment and fun. At the centre of collegial life was the sharing of common meals in a central dining hall. It was significant when the Overseas Students’ Society held its first Annual Dinner in 1990. In 1991 the Hon. Shane L. Stone, Minister for Education and Arts in the Northern Territory Government, proposed that University House should become an International House. The Minister himself was a former tutor and Dean of International House, The University of Melbourne. His former Head, the Warden of IH Melbourne, was Mr Bob Fels. A prominent member of International Houses Worldwide, Fels took the proposal of an International House in Darwin to the IHWW’s conference in Paris in mid-1991. Delegates backed the idea and unanimously resolved to “support and encourage the establishment of an International House at the Northern Territory University”. Soon after, Fels enlisted the support of his own Vice-Chancellor in Melbourne, Professor David Penington. An alumnus of residential Queen’s College (UM) himself, Penington wrote to the NTU’s Vice Chancellor, Professor Malcolm Nairn, offering his endorsement of the creation of an International House at NTU. The University of Melbourne’s Chancellor did the same, Sir Edward Woodward writing to his counterpart in Darwin, Mrs Nancy Geise. Shane Stone had been Sir Edward’s associate in the early 1980s when the latter was a Justice of the Federal Court. 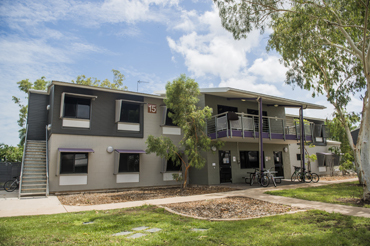 At the start of 1992 University House grew by 33 rooms and during the year another 86, bringing the combined student body in residence at Casuarina and Myilly Point to 347. At the same time planning for an International House continued. During that year NTU Vice Chancellor Professor Malcolm Nairn wrote to the gold mining company North Flinders Mines thanking its board for the decision to back a funding proposal for further expansion of accommodation at Casuarina. Led by the founder of North Flinders, Mr Geoff Stewart, the company had donated $750,000 to match Commonwealth funding. The company had wished to make a significant statement to Territorians and had been persuaded by Shane Stone to do this by funding NTU’s student housing. The result was a further expansion of 42 rooms built by a long-term supporter of NTU, construction company Sitzler. With the latter’s three storey complex, students in residence rose to 389. Dignitaries at the official opening included Mr Tony Palmer, executive chairman of North Flinders, Bob Fels and Shane Stone. Stone was then the NT Minister for Asian Relations and Trade. In unveiling a commemorative plaque in September 1994 he revealed University House had been renamed North Flinders International House. The fusion of local and international, education and work, public and private was a testimony to Stone’s vision. NFIIH was admitted as a member of International Houses Worldwide in 1997. The first Warden of NFIH was Dr Ray Nyland. He retained the collegiality of former years, encouraged a strong student club and by 1998 had overseen the addition of 98 more rooms at Casuarina. These were built to combat the 1997 closure of University House, Myilly Point and its 162 rooms. The shuffle left NFIH with capacity for 325 students, all at Casuarina. The late 1990s were hard for higher education nationwide. Commonwealth insistence on accountability and a tighter fiscal climate had followed federally inspired amalgamations and the emergence of young universities. Management grew to enforce tougher budgets. For NFIH its took the form of securing necessary economies. Warden Nyland left in late 1998 and was succeeded by Manager Ms Bernadette Barnes. In 1999 the dining hall was closed and House services were rationalised. NFIH became a fully self-catered facility in 2000, with 20 rooms given over to student kitchens. If the measures ran the risk of diluting community they nevertheless proved financially successful. What had been a ballooning debt in the late 1990s was cleared by late 2002. Facilities were even improved, including the installation of a much-appreciated swimming pool and student common room. Barnes had saved the House but her departure in December 2002 bode ill fortune. Successors were dogged by declining demand 2003-2006 and debts re-emerged. Charles Darwin University, an amalgamation of NTU and Alice Springs Centralian College in 2003, sought trade through Territory Housing placements to compensate but the clientele was awkwardly split between difficult tenants and students studying. Communal life as it had been known at Casuarina floundered. The arrival in 2007 of Manager Mr Dean Preddy proved a turning point. With a heavier emphasis on international students and a growing housing shortage in Darwin, he registered full occupancy within three years as major refurbishment projects began to improve the physical fabric of the campus. In years following, academic and pastoral programs were re-introduced and communal life placed on a higher footing. Improvements in resident leadership and communal harmony were gained through the efforts of additional new staff. Most notable was Ms Penny Biddle, first as Academic and Cultural Officer, later as Coordinator Resident Services. In 2008 accommodation at CDU’s Katherine Rural Campus was placed under Preddy’s management. Accommodation at CDU’s Alice Springs campus was added in 2011. With North Flinders Mines having become Normandy NFM Ltd in 1997 and then delisted in 2003, Preddy proposed a name change. North Flinders International House gave way to International House Darwin in 2012. Preddy was active in International Houses World-Wide. Darwin hosted IHWW’s bi-annual conference in 2014. By then IHD had gained five new buildings and capacity for 400 residents. 80% of these were international students at an average age of 27. Dr Philip Mosely arrived as Manager, CDU Accommodation Services in December 2015, with oversight of IHD, Katherine and Alice Springs. Preddy’s project program was continued in 2016, centred on improving the landscape and external aesthetics of the Casuarina campus. IHD’s first scholarship program was introduced, underscored by revitalised WiFi. Community life continued to be nurtured under the influence of Penny Biddle. In 2016 CDU unveiled its new Strategic Plan. It called for substantial growth in students over the next decade, especially from overseas. Subsequent development of a new master plan for CDU’s Casuarina campus involved IHD during 2017 and 2018. Concurrent planning for the University to develop a campus in Darwin’s central business district likewise involved Accommodation Services. The brief is large, the vision extensive.